With over 5,500 sq. 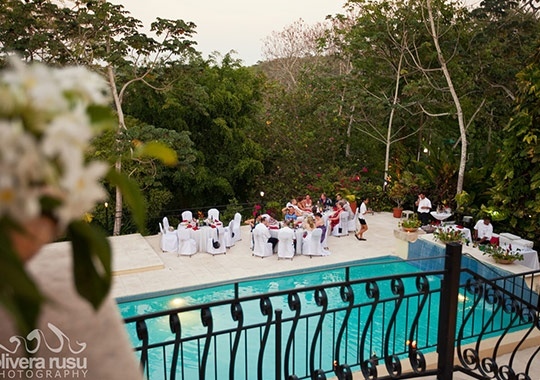 ft. of Hotel meeting space we are happy to host your business meetings, reunions, wedding receptions, and rehearsals or any other San Ignacio events. One of our professional staff will be happy to meet with you and discuss your needs. Please fill out our event request form so we can get an idea of what your needs are and can get back to you with details. Our Bedran Hall and Caracol Meeting Room can be arranged in a number of configurations to suit your meeting or event. Be sure to consider our beautiful pool area as an outdoor reception venue. We are happy to provide 5,700 sf of hotel meeting space for business meetings, reunions, wedding receptions, and rehearsals or other San Ignacio events. Check with our professional San Ignacio meeting staff to discuss this and some of our special meeting packages that we can provide to make your event a success. For more details, download our printable Event Planning Guide. We stayed at the San Ignacio Resort for a meeting in June. The staff was attentive and very helpful, friendly. The property was lovely and well maintained. Enjoyed walking on the trail at the back of the resort and seeing the iguanas. Mayan ruins nearby are worth viewing.